The team at DICE is hard at work on the next entry in the Battlefield series, and to ensure access to the exclusive Battlefield 4 beta, shooter fans can pre-order Medal of Honor Warfighter today. While there is no further Battlefield 4 news at this point – remember, if you don’t see it published here, it’s just rumor and speculation – we did want to take this opportunity to share a few thoughts on the state of the Battlefield franchise. But we’re not ready to talk about Battlefield 4 yet - in the meantime, we hope you will continue to enjoy Battlefield 3 and all the Battlefield 3 Premium content still to come. We invite you to check out Danger Close Studio’s Medal of Honor Warfighter, which is also powered by the Frostbite 2 engine and the free social network, Battlelog. 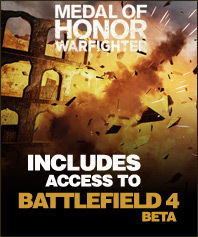 Don’t forget that pre-ordering Medal of Honor Warfighter Limited Edition (at no extra cost) guarantees access to the exclusive Battlefield 4 Beta. Many Battlefield followers were expecting the next installment in the series to be Bad Company 3. Now that the speculation is over, what's your take?
" As ever, we are humbled by the community’s response to the game, and couldn’t be happier with the feedback we have received to Battlefield 3 Premium"
Well we all know that's a big lie, as they never listen or pay attention the communities feedback. The BIG question is....will Bf4 be another ported game for the PC? Seeing a lot of questions about the BF4 beta announce and thought that'd I make a thread where you can find official, definitive information and help to address some concerns that I'm seeing. The beta will be in Fall of 2013. We don't have a BF4 release date yet but, of course, it will be after the beta. We will continue to support BF3. DICE and EA are dedicated to continuing our support for Battlefield 3. Just as we've continued to support and maintain Bad Company 2, we intend to continue providing the best Battlefield 3 experience we can well into the future and past the release of End Game and Battlefield 4. There are several teams at DICE. Starting work on Battlefield 4 does not mean that we will be abandoning Battlefield 3 or working any less hard to bring you the best expansions we can. Your feedback absolutely matters. We will continue to use it to improve BF3 and to make Battlefield 4 even better from day one. Let me know if you guys have other concerns. Obviously, at this point there are some things that we don't know or that we're keeping under wraps. Today's a busy day so it may take me some time to get back to you - thanks for your patience! There will be other ways to get into the beta aside from MoH Warfighter. At this time, however, it is the only way to guarantee entry. We've been seeing a lot of concerns about the pacing of release (i.e. "only" two years after BF3). I think it's worth noting that DICE has released a Battlefield game every two years or sooner AND Mirror's Edge at least every two years. I truly believe that we're in one of the best positions to be creating our next title - Frostbite 2 has matured, we've been gathering fan feedback like crazy, Battlefield 3 continues to expand with features which we can learn from, and we've got more data about how people play than ever. Pathetic, now spend money on bf3 premium pack for nothing ? For few months whole new game. I see your point but the fifth DLC occurs in March 2013. So you will have 6 months until BF4 is released. I consider that timing reasonable. My concern is how different will BF4 be from BF3.